To mark the much anticipated sequel of the Will Ferrell classic Anchorman: The Legend of Ron Burgundy, the film’s eponymous news-reading, lady loving, suit wearing fictional hero has launched his very own Scotch. 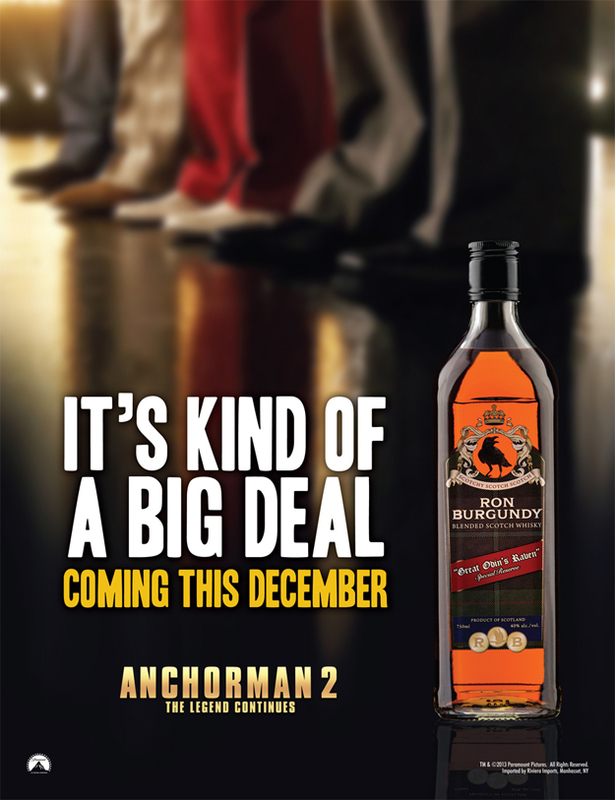 As everyone with even half a brain knows, the moustachioed man himself is as big a fan of the amber fire-water as any homeless tartan-doorway dweller – so in an effort to promote the release of Anchorman 2, Burgundy has created his very own blend. Hitting the nation’s rich mahogany drinks cabinets on the same day as the film hits cinemas, the Scotch named “Great Odin’s Raven Special Reserve” is being heavy promoted by Drink Supermarket and imported by Riviera Imports – offering booze and news hounds alike, a very classy 60 % malt and 40 % grain blend Scotch available for retail. Although currently only being quaffed stateside, the drink’s launch is part of a yearlong campaign of teaser PR stunts to build anticipation for the film, following the exclusive unveiling of a food based stunt with Ben & Jerry’s ‘Scotchy Scotch Scotch’ butterscotch ice cream. What’s more, in recent weeks a heavily hair-lipped and full in-character Ferrell became an internet sensation as footage of his take-over of a news broadcast in North Dakota as Burgundy.